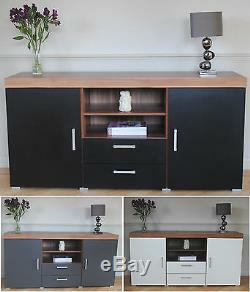 SYDNEY Large 2 Door 2 Drawer Sideboard - Walnut Effect with Black / White / Graphite Fronts - NEW. This 2 door 2 drawer sideboard is from our Sydney range, with a walnut effect carcass and contrasting doors and drawers. Available in three colour fronts: Black, White, or Graphite. Silver coloured plastic handles and feet. Internally there is a central shelf behind each door. Please note as per photos that the white is an off-white rather than a bright/brilliant white. The walnut effect is a medium-brown wood effect. This is a solid and well built piece of furniture. Please note the measurements - this is a large piece of furniture! Supplied flat pack - home assembly required (2 people recommended). Height 80cm x Width 164cm x Depth 45cm. Either collection in person from Faldingworth, Lincolnshire (LN8 3SQ), or. This item comes in 3 boxes, 60kg. Fedexs rules not mine, sorry! Lots of other furniture for sale.... Please see my other items! The item "Large 2 Door 2 Drawer Sideboard Black White Grey Cupboard TV Cabinet Furniture" is in sale since Monday, May 13, 2013. This item is in the category "Home, Furniture & DIY\Furniture\Cabinets & Cupboards". The seller is "drp-trading" and is located in Market Rasen. This item can be shipped to United Kingdom.